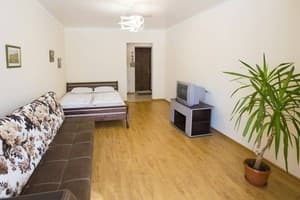 Apartment "at the Station" is located 5 minutes walk from the station zheleznodorozhnoo city Kamenetz-Podolsk. 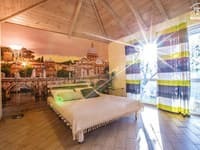 One bedroom apartment with renovated. The apartment is furnished sofa beds with orthopedic mattresses, satellite TV, internet access Wi-Fi. For bedding and towels are provided for guests. It offers a fully staffing the kitchen. The kitchen has a stove, refrigerator, microwave oven, electric kettle, tableware. There is also a washing machine. Nearby there is a fee for parking a car. For travel in the apartment provide reporting documents. The distance from the flat "on the Station" to the bus station - 1,1 km to w / d Station - 550 m, a Hall - 3,2 km. Description of the room: The apartment can accommodate 4 persons. Price is a 2-bed rooms. Perhaps 4 guests (additional fee). It offers a fully staffing the kitchen. The kitchen has a stove, refrigerator, microwave oven, electric kettle, tableware. Apartment "at the Station" is located 5 minutes walk from the station zheleznodorozhnoo city Kamenetz-Podolsk. The distance from the flat "on the Station" to the bus station - 1,1 km to w / d Station - 550 m, a Hall - 3,2 km. From zheleznozhorozhnogo Station can be reached on foot to the apartments (550 m).